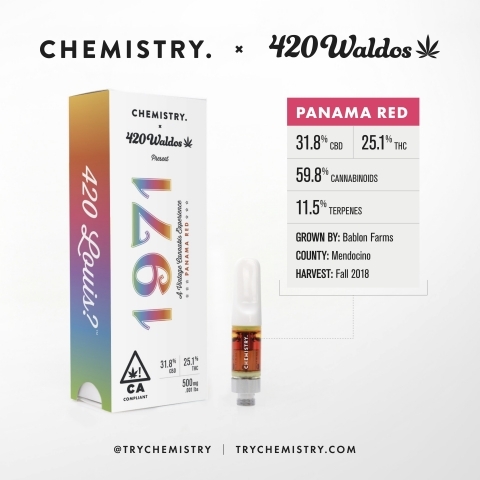 Chemistry and the 420 Waldos bring you 1971: A Vintage Cannabis Experience full-spectrum vape cartridge featuring the old school classic weed strain Panama Red. Oakland-based Chemistry and the 420 Waldos once again invite you on a most righteous journey back in time on 4/20 with this year’s 1971: A Vintage Cannabis Experience special releasefull-spectrum vape cartridge. Most cannabis back in the ‘70s had much higher levels of CBD because that particular molecule—same one that's all the rage now—hadn’t been removed via selective breeding techniques to achieve the crazy high THC-dominant cannabis seen in today’s market. The seeds used to grow Chemistry’s Panama Red were brought back by a Peace Corps volunteer in the early ‘70s after a mission to the strain’s namesake. And this particular phenotype was selected because of its balanced cannabinoid profile. More From BioPortfolio on "Kick It Old School With Chemistry and the Waldos on 4/20"